We’re now living in a digital age with an increasingly visual nature, and its changing the face of communication. Business-to-business, or B2B marketing is not immune to the vogue that is video––in fact, in this day and age B2B video is vital! As a new technology, video killed the radio star by engaging and connecting with the audience in stimulating new ways. Now that video is more accessible to the public than ever, it’s back to kill your outdated B2B marketing strategies. We spoke to marketing maestro, Vanessa Dingle––known for enticing her audiences with online video content––to discover why B2B video is more important than ever, and the best ways to ensure you don’t get left behind. 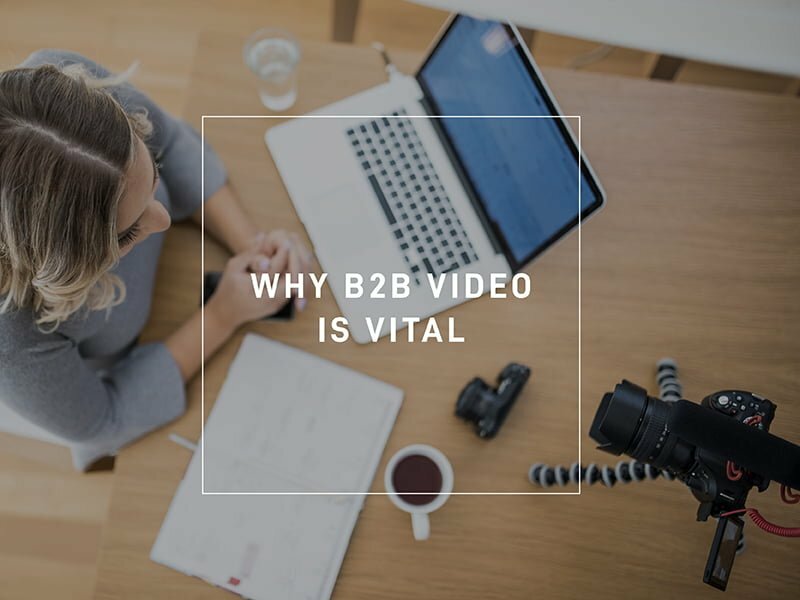 WHY IS B2B VIDEO VITAL? We know that social media’s algorithms are changing to become more multimedia-inclined, but you only have to scroll down any feed from Facebook to LinkedIn, to see the true power of video––it’s everywhere! The algorithms and all of the social channels are telling us that we love video and that we all consume video, so if we don’t get on board we simply won’t be prioritised. Video has been prevalent in B2C marketing strategies for a long time, so as our clients become video consumers in their private life, it only makes sense they’d respond positively to video in a professional setting too. A large majority of businesses already use B2B video and audiences expect to see this kind of content, increasingly making time for it in their day-to-day. In fact, 85% of people have said they would like to see more video content from brands in the future. By educating clients about your services and skills with video, you’re not letting them get lost in marketing jargon and clichés. You’re creating something that will alleviate any confusion they have about your brand, your team, and the benefits of your services and products. We have a thirst for knowledge, so we feed that thirst for knowledge via telling stories with pictures and sound and voice. Don’t underestimate transparency and the power of standing out from the smoke and mirrors of the marketing landscape. Ask yourself what the clients are getting out of their relationship with your business, and think of your videos as an opportunity to involve them and engage them. There’s a motley crew of B2B videos out there, each with the power to captivate your clients, inspire them in their own work, and build an honest image of your business. Whether you’re rolling the camera in your best selfie-stance, producing an instructional video or a special announcement, telling a story, or simply sharing some great advice, you’re creating a personality for your business that your clients will want to see. Try a combination of creative content and test the waters, keeping an eye on your analytics to see what works best for your target audience. While B2B video marketing is still relatively new, it’s no longer uncommon, over 80% of businesses use video as a marketing tool. Don’t be scared to stand out and create unique video content. Enthusiasm is the universal language and emotion is infectious, so harness the passion and personality of your business and shout it from the rooftops. Make sure the intention of your video is clear before you start, by asking yourself what message you want to get across. If you’re answering a question or sharing some advice, let your audience know that! Put it in your title, in your keywords and hashtags, and plaster it on the thumbnail of your video to give your clients a reason to click play. If your message is loud, your volume won’t have to be. Did you know that around 85% of B2B videos on Facebook are watched with the sound off? Your video content should communicate visually and be interesting enough to hook the audience on mute, so think about whether this means adding subtitles and captions or explanatory graphics. You’d be surprised how much incredible content you’ve already created that simply needs to be repurposed for video. It isn’t always necessary to go right back to the drawing board for a new idea. Bring your best content back to life by updating it and creatively repackaging it to engage new audiences. B2B videos can be as short as 30-seconds or as long as ten minutes, but unless you’re a budding-Steven Spielberg, any more than a few minutes will have your audience losing interest. “Now video has to be really short and succinct, because our goldfish memory means an average view on a video is no more than 30 seconds”, says Vanessa. Ensure your information is condensed, keeping only what is essential. Over half of B2B videos go for no longer than a minute, which is really all you need to hook the audience, give them a problem, solve that problem, and lead them back to your services with a CTA. Otherwise known as a CTA, the call to action is your way of telling the audience where they can go next, to find more information on the subject or find relevant products and services. “That’s where we saw this revolution of video bringing the Call to Action into the first five seconds of the video, because none of us were watching it to the end”, says Vanessa. You don’t have to fit everything into your B2B video, but make it easy for your client to take the next step by pointing them in the right direction at the start your video. The earlier you do it, the more likely they are to see it. If you’re targeting businesses with your video content, it’s important to remember what they want to see it and how they’re going to engage with it. “It’s all about understanding your consumers, and your consumer’s behaviour”, says Vanessa. Do it at daybreak – If you’re connecting to business networks, your target audience will have the most time to watch video content between 7am and 11am on weekdays. Use these prime dawdling hours of train ride commutes and email-checking to your advantage. Before the caffeine has kicked in and the urgency of their to-do list is yet to hit them, you’ll get the most views early. Ease your clients into their morning with some light-hearted, informative and inspiring content. Do it on the desktop – For B2B it’s crucial that your videos are optimized for viewing on a desktop or computer, because that’s exactly where your target audience will be. Around 89% of B2B videos are watched on big screen browsers, so make sure your videos cater for desktop and mobile viewing. Sharing is caring, so spread the magic across all of your social media channels, taking into consideration the times that your target audience will be most active online. B2B video might seem like the king of LinkedIn, but it’s important to plaster your creative content everywhere, from YouTube, Facebook and Instagram, to LinkedIn and Google My Business. Putting video on Google My Business optimises SEO, and allows you to own your front page on Google and be highly competitive in brand searches. Guarantee far better engagement by uploading your videos natively on each platform, as studies have shown that aggregators like Facebook hugely prioritize native videos above those that have been shared from YouTube. Consider creating an eye-catching thumbnails for your posts and use plenty of popular keywords in your hashtags and captions. Promoting the business to builders in South Australia, this corporate video will gives authenticity to their communication, while the quality video content is rewarded highly with online engagement. Video testimonials are a fantastic way to encourage word-of-mouth communication, ensuring that the message is authentic, reflective of your results, and conveyed by someone totally independant of your business. Directed towards healthcare specialists and professionals such as GP’s, this informative video promotes HealthELink, a platform and communication system that would improve the Hepatitis C treatment for their patients. If it all seems a bit too hard, don’t let the if’s, but’s and maybe’s get you down. At Newstyle Media we have a specialist video production team dedicated to enhancing your digital marketing campaign. Our video content production rock stars are obsessed with making great video content; from pre-production, equipment, filming and editing through to promotion – we’ve got you covered.